This article is about shark enemies in the Donkey Kong franchise. For other uses, see Chomp (disambiguation). Chomps are shark enemies that populate the waters of Donkey Kong Island. They resemble tiger sharks and swim at moderate speed, biting any Kong upon contact. They have a smaller variant, known as Chomps Jrs. A Chomps next to the letter Y in the Game Boy Color port. 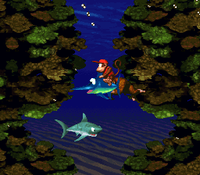 Chomps first appear in Donkey Kong Country. 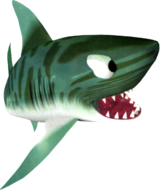 Although Chomps are one of the larger underwater enemies, they are as strong as other underwater enemies, such as Bitesizes and Chomps Jrs. (but not including Croctopuses). Chomps are the slowest at moving underwater, but this is compensated for their height because it is easier for the Kongs hit into them. Like Bitesizes and Chomps Jrs., Chomps swim around in a slightly wavy fashion. They can only be defeated from Enguarde using his stabbing attack. Chomps appear in three of the four underwater stages: Coral Capers, Clam City and Croctopus Chase. They do not appear in the final underwater level, Poison Pond. In the Game Boy Color port, a sticker of Chomps with the "Y" letter can be printed from the Game Boy Printer. Chomps return in Donkey Kong Land, although here they borrow the appearance of Chomps Jrs. from the previous game. 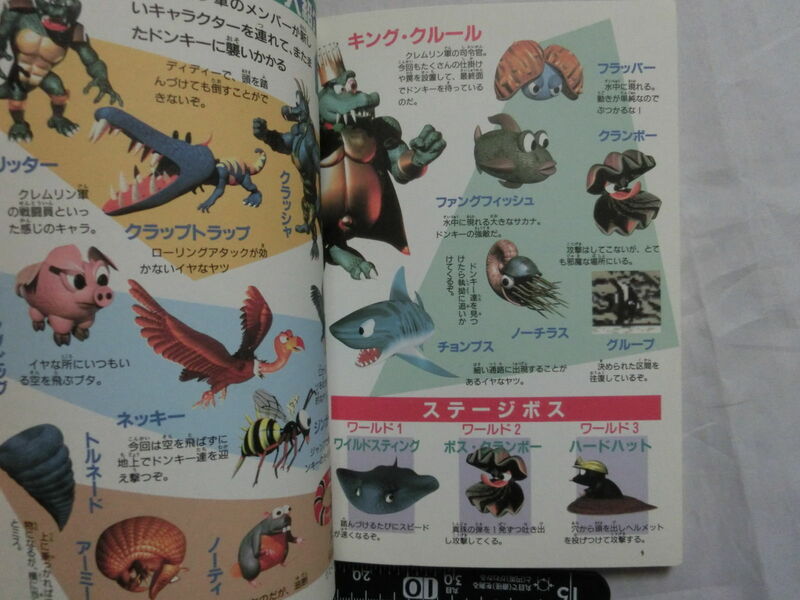 This is suggested by an official Donkey Kong Land guide book published in Japan, which lists the regular Chomps as an enemy instead of Chomps Jr.
Chomps roam the submerged parts of Kremlantis, being found in Kremlantis Kaos, Chomp's Coliseum, and Nautilus Chase. Like the other underwater enemies, Chomps cannot be defeated because of Enguarde's absense from the game. Chomps reappear as enemies in Donkey Kong Barrel Blast, during the underwater sections of Salty Sea, Shimmering Sea, and Open Ocean. They are much bigger and look more intimidating than before, but can still be defeated from a single hit. Electrified Chomps are also found on Open Ocean. Like normal Chomps, they can be defeated in one hit, but the Chomps will also electrocute a racer and make them lose their speed, unless the racer attacked it while invincible. Two Chomps in the Club Nintendo comic. In the Club Nintendo comic adaptation of Donkey Kong Country, two Chomps try to attack Donkey Kong and Diddy Kong. They are supposedly a part of the "Chomp Police". This seems to be a self-promoted position, given that the other underwater creatures dislike them. Chomps has unused sprites for being defeated in Donkey Kong Land, suggesting it could have been defeated at some point during development. Several Chomps are seen in the trailer for Donkey Kong Racing in the background of the logo and underwater when Tiny Kong and Diddy Kong are riding on a regular Enguarde and a purple Enguarde. This page was last edited on February 27, 2019, at 18:19.